2 Live Crew "Trow The D"
Anquette "Throw The P (X-Rated Version)"
Herman Kelly & Life "Dance to the Drummer's Beat"
Given Miami's status as a magnet for expats and transplants, it's apropos that the group most synonymous with the city's hip-hop scene actually originated somewhere else. Chris "Fresh Kid Ice" Wongwon, David "DJ Mr. Mixx" Hobbs and Yuri "Amazing Vee" Vielo (who was replaced by Mark "Brother Marquis" Ross) started 2 Live Crew all the way across the country in Riverside, California, where they recorded their earliest singles while stationed at that city's March Air Force base. 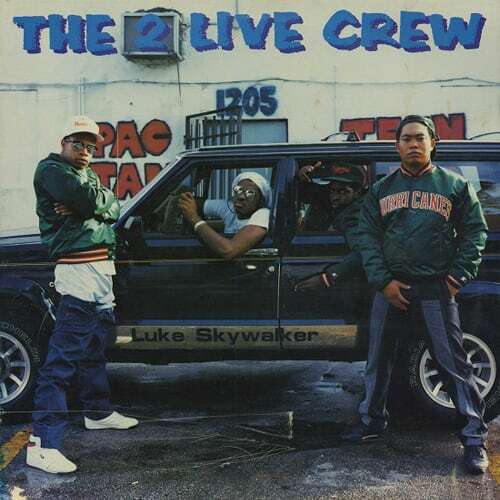 The last track the group made before leaving Riverside would also be its first release on Luke Skyywalker Records, the label started by Luther Campbell, who was not yet the group's flamboyant leader but an ambitious promoter responsible for bringing them to Miami. Built around a sample of Herman Kelly and Life's "Dance to the Drummer's Beat," "Trow The D" (as it was spelled on the 12" label) was inspired by the overtly sexual dance style the group had seen kids doing at Campbell's club Pac Jam during sets by his Ghetto Style DJs. The song (along with "Ghetto Bass") proved so successful that Campbell, taking a page from the battle-of-the-sexes answer records to UTFO's "Roxanne Roxanne," recruited his cousin Anquette Allen to record a female response, "Throw the P, " adding the sort of X-rated comedy record samples (in this case by comedian LaWanda "Aunt Esther" Page) that would become staples of the 2 Live/Luke Skyywalker sound. Following its use in "Trow the D" and "Throw the P," "Dance to the Drummer's Beat"—the lone hit by Miami percussionist Kelly—became Bass music's foundational breakbeat. Sampled in countless local party records, it's as vital to Bass' DNA as "Triggerman" is to New Orleans bounce.